So when issues do arise, it’s imperative that you provide your customers multiple avenues to resolve their problems. Customers these days expect omnichannel integration. What does that mean exactly? It just means that customers expect you to honor the same offers in all channels (web, in-store, phone, mobile), and they expect you to let the customer transition between these distribution channels without it being a hassle for them. For example, if you own a retail store and the customer purchased the item via your website, they expect to be able to return an item. So what if you are just starting out as a solopreneur or have a limited budget? Handling your customer service when first starting out is fine but as your sales increase, you’ll want to advance to more powerful online customer support systems (we'll cover that in next week's post) with more functionality that can take this task off your plate. 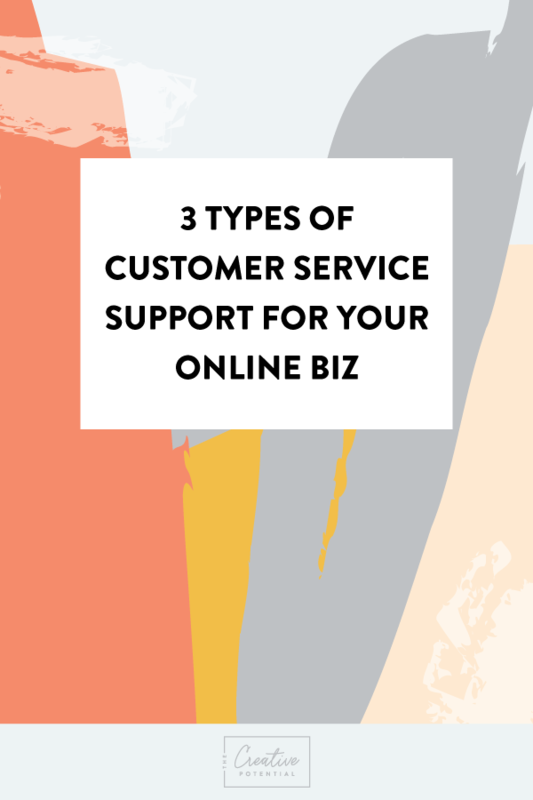 In the meantime, here are 3 types of customer service support strategies you can implement in your own business. Customer Service conducted via email support is a great starting point for any ecommerce business because let’s face it replying to emails is something we all know how to do. Plus it is done behind the scenes instead of a more public platform like social media. Here are some tips for your email support strategy. Create a dedicated email address used for support. Make it separate from general inquiries and your personal email address. This ensures customer issues never get lost or buried in that inbox of yours. Set up an auto-reply message that lets a customer know their message has been received and how long it will generally take to get a response. Try to be timely. I wouldn’t take longer than 48 hours to tackle the issue. No one likes getting a response saying their email will not be addressed in 5 days! When you reply, suggest a solution to the issue as quickly as possible. Email support gives you plenty of time to think and craft the perfect response, so use it to your advantage. Just like email support, customer service done via phone support adds a personal element to the interaction with the customer. Both the customer and the seller become humanized when using this method. It can be great for diffusing tension. Remember this advice when you’re developing your phone support strategy. Be prepared before the call even begins. Make sure that you or whoever is handling your customer service is completely up-to-speed on your products and policies. If confidence and knowledge are not heard the customer will know it. That leads to bad feedback and testimonials- the last thing you want to happen! Now is the time to connect with your customer. You are bringing that in- store experience to them right over the phone. Take time to show interest in the customer and to build a connection. Learning about them can help you more deeply understand the nature of their issue. The customer will appreciate the care you have for them. Don’t be argumentative with the customer. If you happen to get an angry customer on the phone say let’s see how we can resolve this for you. Try to make the customer calm and most of all happy when you are ending the conversation. Customer support can also be conducted via social media but it might not be a method that is preferred by every online business. When a customer vents on social media, it is usually due to not getting a response from either their email or call. So what do you do if a customer complains about their order on social media? Since these complaints are public and not private like email or phone support, a lack of a response on your part can cause the customer to become irate and in turn scare off potential new customers to your site. Keep the following in mind when offering support over social media. Post a public and courteous response to the comment so everyone can see that you are open to resolving the issue as quickly as possible. Suggest to the customer to email you or ask them if you can private message you. This can be done through private messaging. It’s imperative that you get the customer out of sight of the public. These customer service methods will be sure to create lifetime customers that keep returning back to your site as well as convey to new customers you care about them!